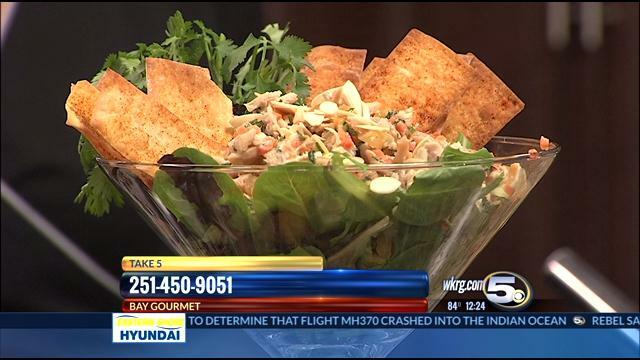 Did you catch us on WKRG with WKRG John Nodar yesterday? We whipped up our famous Eggs Benedict, which will be served at next weekend's Jazz Brunch at Azalea Manor! Place egg yolks, mustard, lemon juice and cayenne in the blender for about ten seconds or until fluffy. Slowly pour melted butter into blender while it runs. The sauce should thicken quickly. Set sauce aside in a hot water bath to keep warm. Don't miss the New Orleans Style Jazz Brunch this weekend (August 16) - only $35 per person with a cash bar! - Place ingredients for dressing in a blender or medium sized bowl with mixer and blend well. 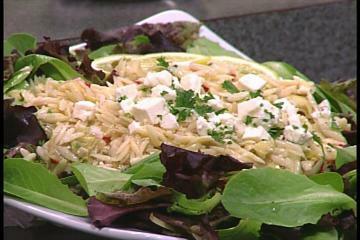 Toss with Orzo and vegetables, cover bowl with plastic wrap and refrigerate for at least an hour. Serve cold. Mix all ingredients for the Ceviche and refrigerate for at least one hour. Preheat oven to 350 degrees. Slice wonton wrappers in half and place on baking sheet. Spray with cooking oil and bake in oven for 5-10 minutes or until slightly browned. Sprinkle with Cajun seasoning and serve with Ceviche. After cutting and rinsing the fish pat dry. Mix all the ingredients for the panko crust and dredge fillets in the mixture. Heat 1 tablespoon olive oil and 1 tablespoon butter in skillet. Place fillets into skillet and brown on each side – about two minutes per side. Place fillets into a glass dish, uncovered and finish cooking them in an oven at 350 degrees for 10-15 minutes (depending on thickness of the fillet). Any additional panko crust mixture can be used to top them before placing them in the oven. To make the sauce combine the shallots, white wine and lemon juice in a non-reactive saucepan over high heat and reduce to two tablespoons. Add the cream to the reduction and bring it to a boil and immediately reduce the heat to low. Add the butter, one cube at a time, whisking first on the heat and then off of the heat. Continue adding the butter until the sauce emulsifies and reaches a thick sauce consistency. Season with salt and pepper. This can be stored in a thermos until it is ready to be used to prevent it from breaking. Remove fish from oven and top with meyer lemon buerre blanc and serve. Allow pastry to thaw and use a cookie cutter to divide sheets into 8 squares. Mix together the shrimp, crabmeat, cream cheese, cheese, lemon juice and seasoning. Using a teaspoon, place a lump of the mixture in the center of each pastry square. Fold the pastry squares together like an envelope or simply pinch them together at the top like a purse. Brush pastry with egg wash if desired. Bake in 350 oven for 25-30 minutes or until golden brown. In a saucepan bring the chopped plums to a simmer until they turn into a sauce. This takes about 15 minutes at a low heat. When the plums are soft add the cup of orange marmalade. Allow to cook for a couple of minutes and then add the brandy and allow to mixture to cook for an additional five minutes at a low heat or until the alcohol had cooked off sufficiently. Serve the packages hot with the sauce spooned over the top. Serves 8 people. Preheat oven to 450. In a large bowl combine the bread crumbs, garlic, rosemary, salt and pepper. Toss in 2 tablespoons of olive oil. Set aside. Season the rack of lamb with salt and pepper. Heat olive oil in skillet and sear the rack of lamb for 2 minutes on each side. Remove from pan and brush with mustard. Roll the rack in the bread crumb mixture and place in a baking dish with bone side down. Place lamb in preheated oven for 10-12 minutes which will cook them to a medium pink center. Remove them from the oven and allow to sit at room temparture for 5 to 10 minutes. Mix ingredients for the Salsa and served with the warm lamb chops. Puree ¾ cups of the butter beans with ¼ cup reserved broth until smooth. In a bowl – mix remaining butter beans, puree, 1 TB broth, corn bread, green onions, jalapeno, olive oil, flour, salt and pepper. Add the egg and mix again. Form into small cakes – dust with flour and pan fry in vegetable oil until golden brown. Serve hot topped with tomato salsa. Trim all of fat and silver skin from tenderloin. Tie the tenderloin in three to four places - about every three inches - with butcher's twine. Mix the red wine, salt and pepper, garlic and greek seasoning and coat the tenderloin with it. Cover and marinate in the refrigerator overnight. Take meat out at least two hours before cooking. Allow the meat to come to room temparture. Preheat oven to 500 degrees. Place tenderloin in oven for exactly 20 minutes. Remove tenderloin and wrap in foil two times. The tenderloin will continue to cook and come to a perfect medium temparture. Mix ingredients for cream sauce and serve with the tenderloin with rolls. Mix eggs, milk, vanilla and cinnamon in a large mixing bowl. Add dried bread pieces and allow mixture to absorb into bread. In a skillet, saute butter and bananas until slightly softened. Add brown sugar and allow to melt, then add rum or whiskey (optional). Pour egg and bread mixture into large 9 x 13 greased casserole dish. Top with sauteed bananas and bake at 350, covered with foil for about one hour or until browned and cooked through. Slice bacon slices in half. Lay bacon slices out and place a teaspoon of cream cheese in middle of slice. Place jalapeno slice and piece of duck, beef or chicken on top. Roll the bacon over until the stuffing is wrapped. Skewer with toothpicks and place on ungreased baking sheet. Bake at 400 for 25 - 30 minutes or until the bacon is crisp. Some of the cream cheese will run out, that is okay. Serve hot. Preheat oven to 350 degrees. Allow puff pastry of pie shell to come to room temparture. Sprinkle with grated parmesan cheese and bake for 5 minutes. Pull from oven and allow to slightly cool. Mix cheeses and mayonnaise together in a bowl. Using a spatula, spread the cheese and mayonaisse mixture onto the puff pastry or shell and then top with sliced tomatoes and optional ingredients. Bake in oven for 15 minutes or until slightly browned and bubbly. Top with fresh basil and serve warm. Mix all burger ingredients together – form into small patties and grill or saute to desired temperature. Serve with mayo on mini slider buns. Toss sliced potatoes with olive oil, salt and pepper. Roast at 400 degrees for about 20-25 minutes – until lightly brown and tender. While potatoes are cooking – combine all other ingredients except the cilantro in a blender or food processor until smooth. Once the potatoes are cooked – toss them with the lime-chipotle dressing and the chopped cilantro. Mix ingredients in food processor or blender and heat on stove top in saucepan. Top shrimp and sausage with bbq sauce and serve hot. We always have so much fun with WKRG on their cooking segment! This week, we've put a spin on a regular chicken salad recipe by adding the sweetness of apricots, the crunch and texture from the carrots and a fresh bite by adding cilantro to the mix. Its super easy to make and feeds a crowd! We hope you'll try this recipe and let us know what you think! Mix chicken, apricots, green onions, carrots and cilantro in a medium bowl and set aside. Mix ingredients for Apricot Ginger Dressing in a small saucepan and cook over low heat until melted – let cool. Toss the dressing with the chicken mixture and serve on top of the romaine ribbons. Great garnished with wonton chips or crunchy Chinese noodles.